The pulse oximeter measures simple & uncomplicated, at the same time the arterial oxygen saturation and heart rate. Ideal for private use, clinic, for rescue services, allergy sufferers or athletes (according to performance). The display of the pulse oximeter SP02% gives a statement about the current blood oxygen saturation in percent, the display PR bpm shows the heart rate in heart rate per minute. In addition, these values are still supported graphically. 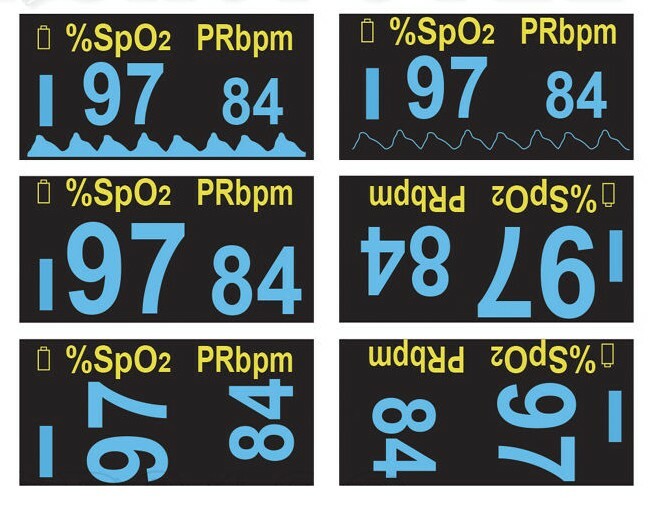 During the oxygen saturation, a corresponding SP02% wave is displayed under the values, the signal strength of the heart rate is displayed as a histogram bar on the side. Note: The pulse oximeter should not be used as a monitoring device since no alarm function is integrated. 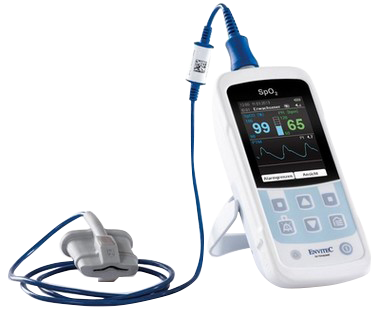 The pulse oximeter plays a supporting role in the diagnosis of patients. It does not replace any medical diagnosis. Bright light sources around the sensor can falsify the measurement result. 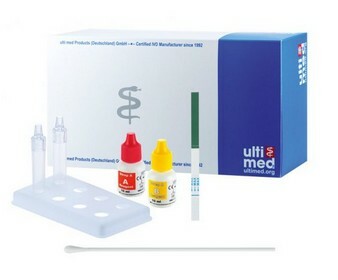 Low blood pressure, low contractility index, anemia, shock or low body temperature lead to measurement errors. Das Display ist prima ablesbar - Die Messung braucht nicht lange - Gerät sitzt gut auf dem Finger! tolles kleines Gerät zum unschlagbaren Preis! Ich habe dieses Gerät für meine Mutter gekauft (sie hat COPD) um Ihren Sättigungswert im Auge zu behalten. Das Gerät ist dazu gut geeignet und leicht zu bedienen. Schneller Versand - Selbst erklärendes Gerät. Nach Einlegen der passenden Batterien sofort und lang anhaltend einsatzbereit. Große, klare Anzeige. Schnelle Reaktion. Zügige, batterieschonende Selbstabschaltung, wenn der Finger nach der Messung entfernt wurde.Lohnenswerter Kauf.